The development of self-management skills is one of management best practices for those people who have decided to become more productive employees. While companies tend to spend large amounts of money and energy to provide their employees with special self-management skills & training, each worker can personally organize self-assessment surveys to define whether he or she has the required skills set. 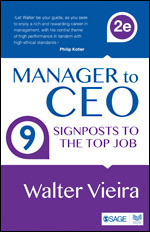 In one of the books published by SAGE Publications, “Manager to CEO” author Walter Vieira has dipped into his experience during a career spanning over 40 years as a corporate executive, management consultant, and teacher working across Asia, Europe, and the Americas. Through this book he explicates the notion that for achieving growth in life, one need to be proactive and should always remain open to the concept of Self-development. “Self-development depends on self-understanding. Everyone has both weak and strong points. It is important to come to terms with oneself to recognize the qualities that must be changed or overcome and the strengths that can be emphasized and better utilized. Greater self-knowledge helps you to put your best qualities together to form a more unified, integrated whole. The book is a guiding star for managers aspiring to become CEO’s. It elucidates that to become a successful leader every manager should adopt a habit of self-analysis and self-examination. Self-awareness not only helps managers identify gaps in their management skills, which promotes skill development, but also helps them find situations in which they will be most effective. Self-awareness also assists them with intuitive decision making, and aids stress management and motivation of oneself and others. The book is a guide to understanding and surviving in the corporate environment. Designed to give professionals a comprehensive overview of the modern workplace, it also covers a wide range of other issues that managers face in organizations as they move up the corporate ladder.